Manaháhtaan Subway by Jordan Engel, 2019. 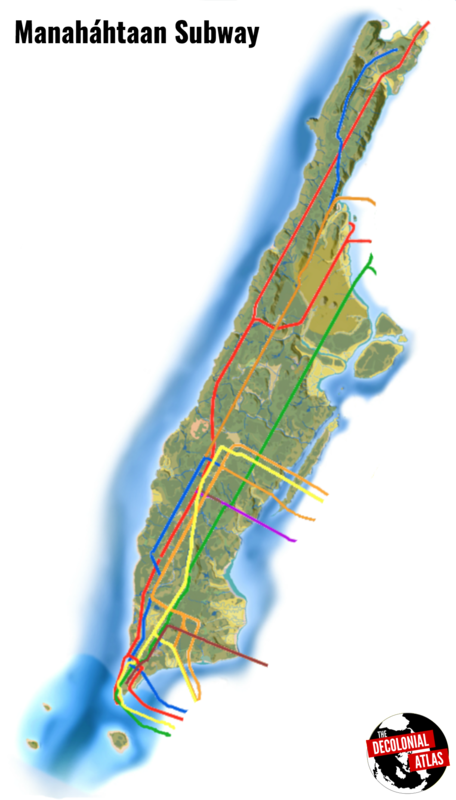 Inspired by our earlier map of Mexico City’s Buried History, this map superimposes today’s New York City Subway system on a map of the island of Manaháhtaan as it was prior to colonization. The modern island would almost certainly be unrecognizable to the Lenape who called it home and made bows from its hickory trees (Manaháhtaan means “Place where wood is gathered to make the bows.”) Gone is Manaháhtaan’s flowing surface water and its bountiful wetlands. Its rolling topography has mostly been leveled. Its shoreline has been transformed through land reclamation. For most New Yorkers, the MTA subway map is the main way they relate to the city’s geography. They might not know where the Collect Pond once was (it was in Chinatown), but they sure know where to catch the Q train. On a concrete island, it’s a powerful practice to pause and reflect on what lies beneath the pavement. And no, I don’t mean the rats and the subway tunnels. Strangely, doesn’t show the 7’s extension westwards to 34th Street-Hudson Yards. Otherwise, a really interesting exercise!